Due to demand, more copies of the DVD have been ordered and are now available for purchase (as of 30/3/2011). The Report, Summary and detailed 'data trawls' are available as part of a combined CD-Rom and DVD set. The pack includes the full Research Report - the project rationale, narrative, methodology and detailed findings together with detailed 'data trawls' from each of the 4 main case studies - and edited highlights from the four main case study performances and also from keynote speeches (by Catherine Hughes, Baz Kershaw, Laurajane Smith and Tony Jackson and Jenny Kidd) given at the international conference held at the University of Manchester in April 2008: "Performing Heritage - research and practice". The performance extracts illustrate vividly and uniquely the diversity of museum performance and costumed interpretation practice, and the diversity of sites and audiences that the practice serves. Click here for more info. What is Performance, Learning and Heritage? 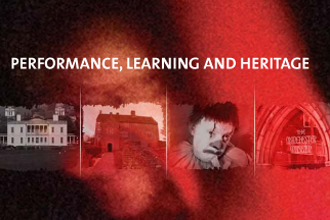 The PERFORMANCE, LEARNING AND HERITAGE research project is an investigation into the uses and impact of performance as a medium of learning and interpretation in museums and at historic sites. Funded by a major research grant from the Arts & Humanities Research Council, the project ran for three and a half years from 2005 to 2008. Aspects of the research continue however, and the database continues as a publicly available research resource, gathering new and updated material, at least until the end of 2010. The Performance, Learning and Heritage team have created an online database housing hundreds of digital artefacts connected with war and performance. The database contains documents, film, images and audio along with a substantial directory of organisations and an events archive. The data can also be displayed geographically using aerial world maps. To launch the database click here. For more info visit the database page here. Read about the four case studies - The National Maritime Museum; Llancaiach Fawr Manor; The Herbert and Triangle Theatre Company; and The Manchester Museum. OFFICIALLY LAUNCHED AT THE V&A (Victoria & Albert Museum London): Theatre & Performance Galleries ON FRIDAY 25th MARCH. This book emerged initially from the ongoing work of the Performance, Learning and Heritage project and from the international conference held in Manchester in 2008. It brings together the most up-to-date thinking and research in the field and will, we hope, promote critical and stimulating debate about achievements, risks and potential in museum theatre and live interpretation. The book consists of a variety of contributions from those engaged in research, practice and innovation in this field around the world. Among the contributing authors are: Mark Fleishman (University of Cape Town); Baz Kershaw (University of Warwick); Catherine Hughes (Atlanta History Center & museum theatre consultant, USA); Helen Rees Leahy (University of Manchester); Laurajane Smith (Australian National University); Triangle Theatre Company (Coventry); and Tony Jackson and Jenny Kidd. NOTE: The price of the book is now £55, not £60 as originally advertised. Click here for video clips related to Chapter 9 (Baz Kershaw: 'Nostalgia for the future of the past').